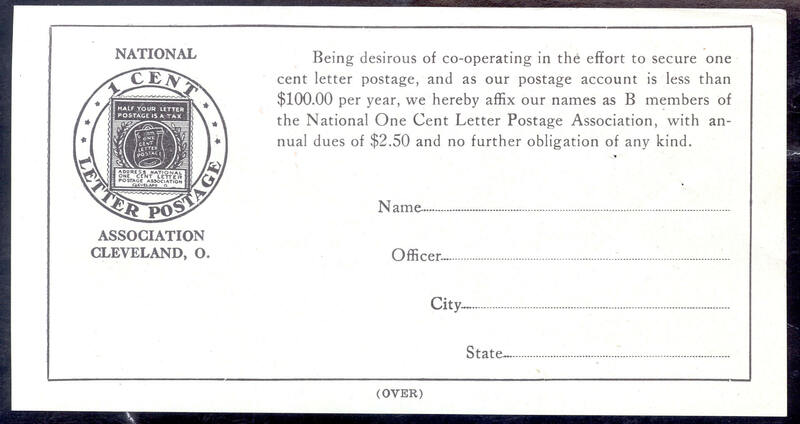 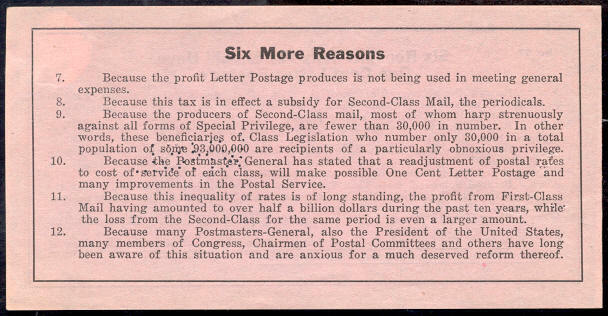 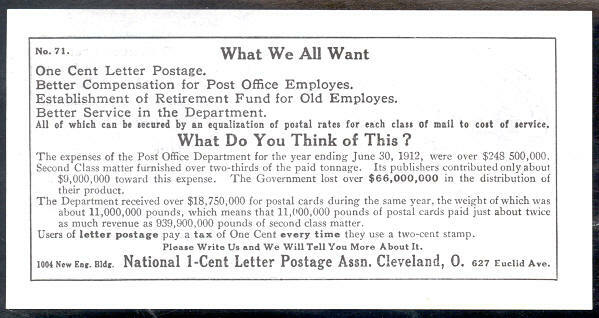 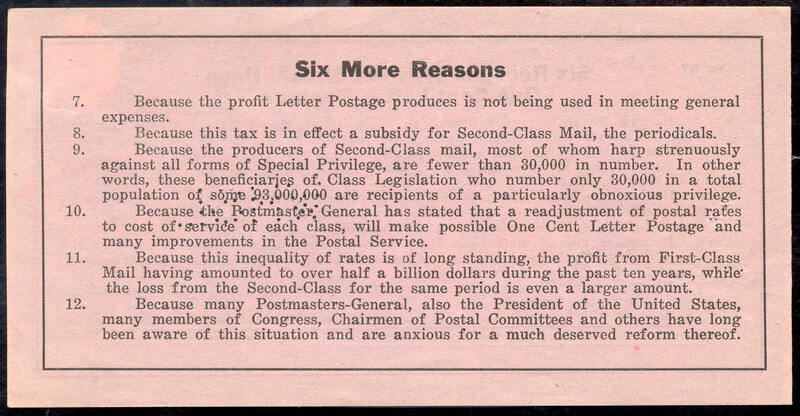 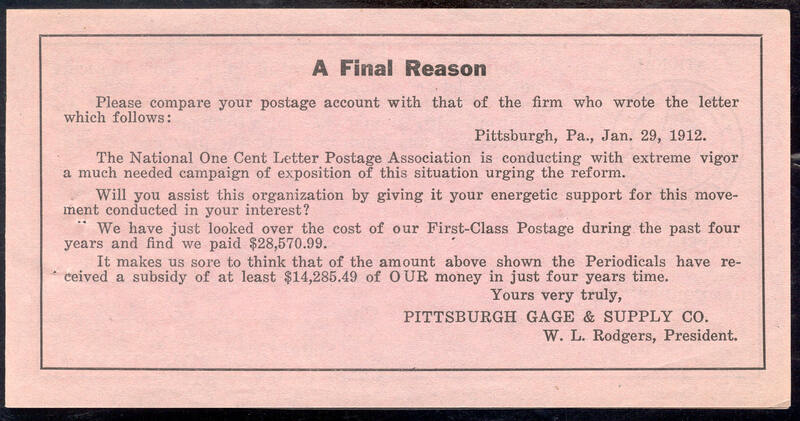 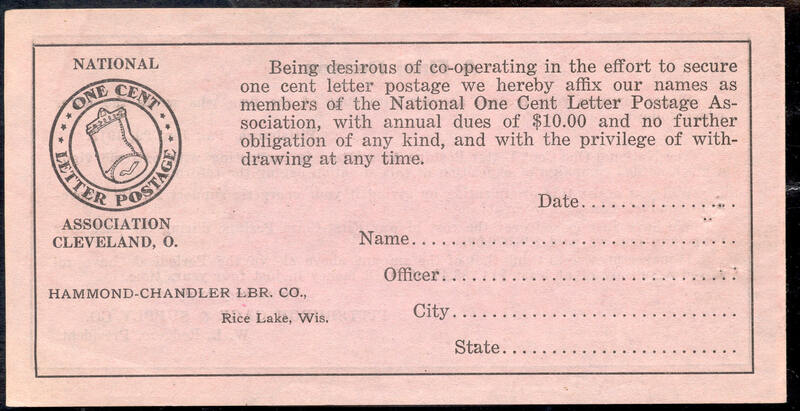 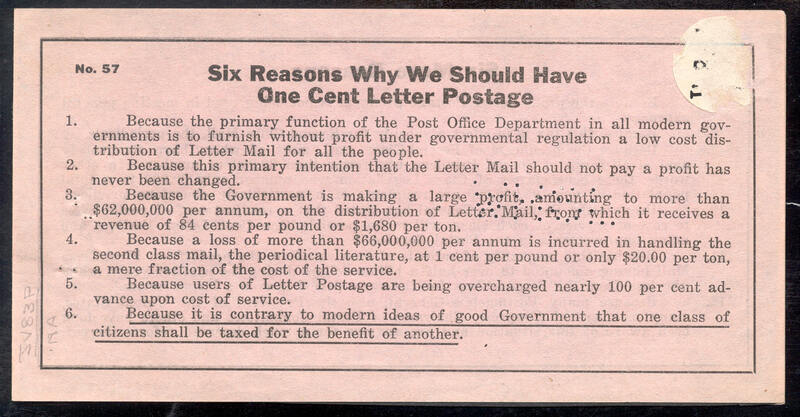 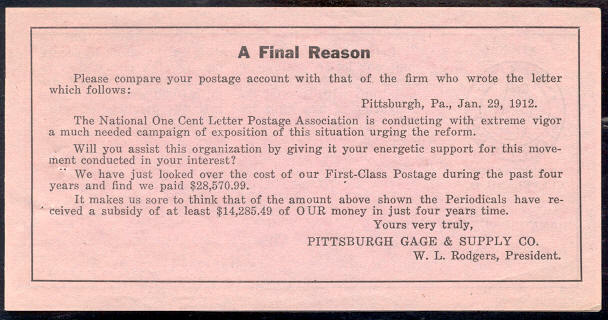 Numerous pamphlets and other materials were created to promote the cause of 1¢ postage and recruit new members into the Association. 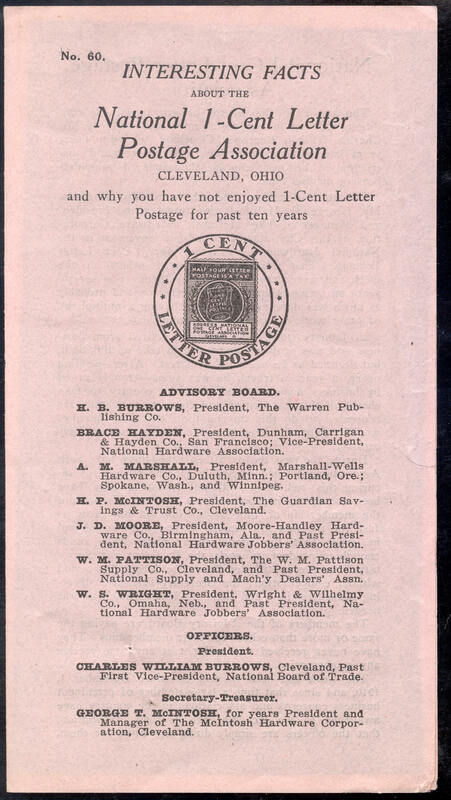 Most pamphlets were numbered seemingly in chronological order. 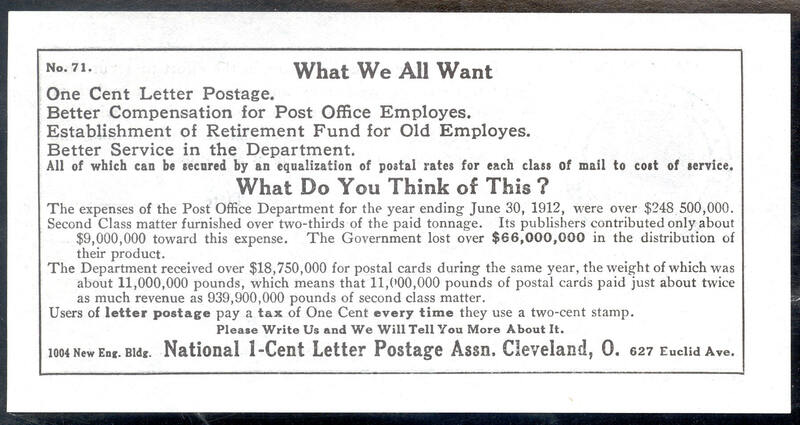 In the early 1990s, it was reported that the lowest number in the National Postal Museum was #35(undated) and the highest was #1033, dated June, 1922. 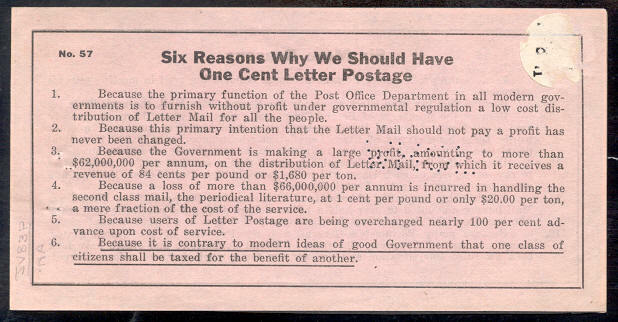 Pamphlet No. 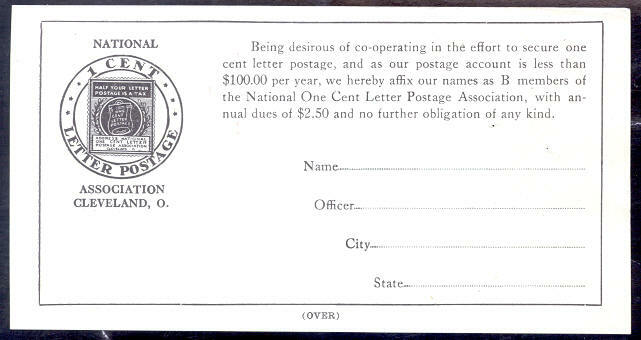 57 is a single piece of light weight paper folded vertically creating four printed panels and acting as a membership solicitation form. 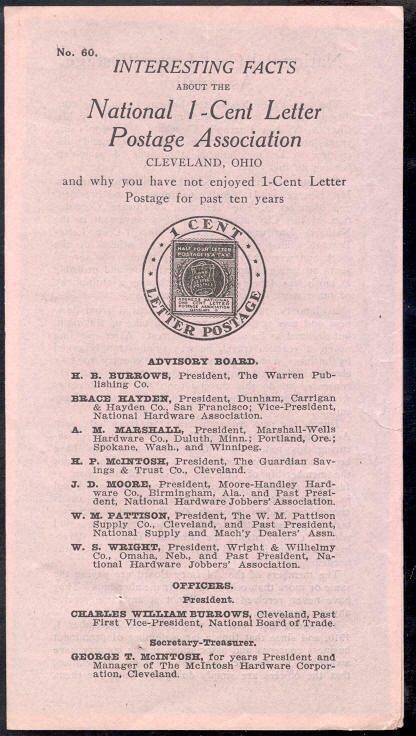 Pamphlet No 60 is another four panel piece also printed in a vertical format. 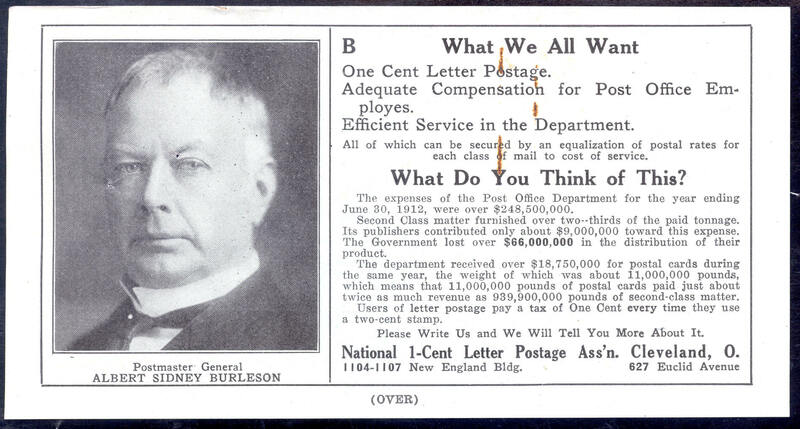 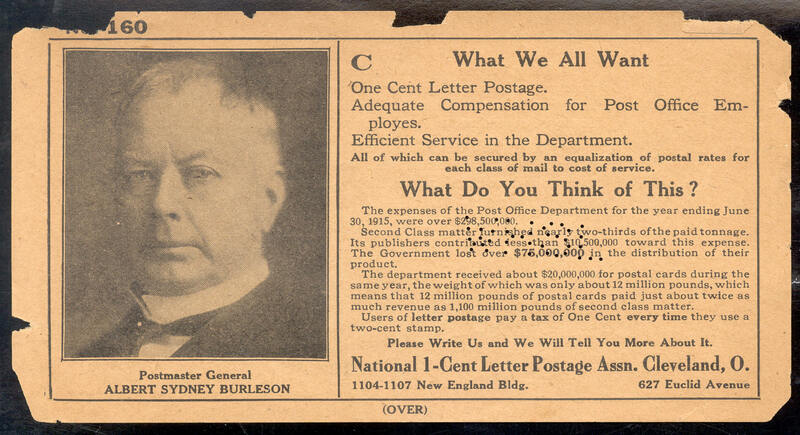 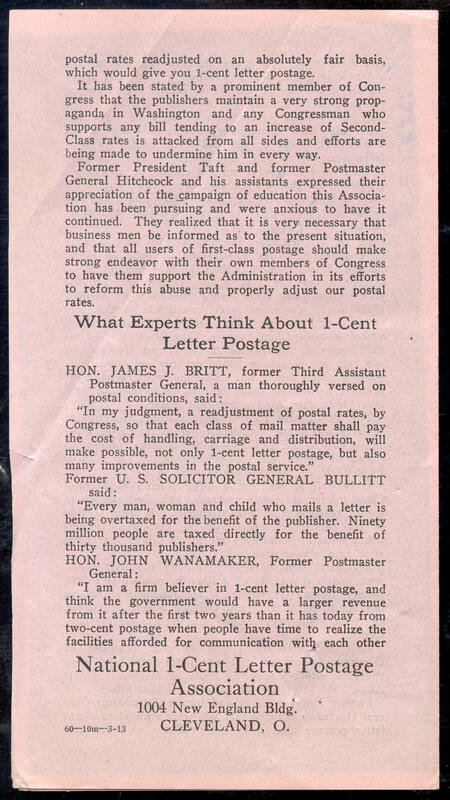 This piece, seemingly produced in 1913, lists the officers of the Association and presents a brief history of the efforts for a reduction in First Class mail rates. 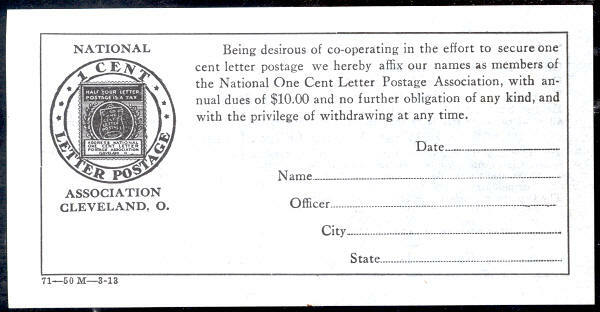 No 71, like No 57, acts as a membership application form, this time printed with only two panels about a year later than No 57. 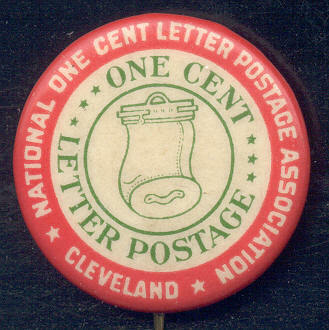 Notice the logo on the reverse now incorporates the image of a seal which looks much like a Type III but is not a coil and the wording on the bottom tablet is spaced differently. 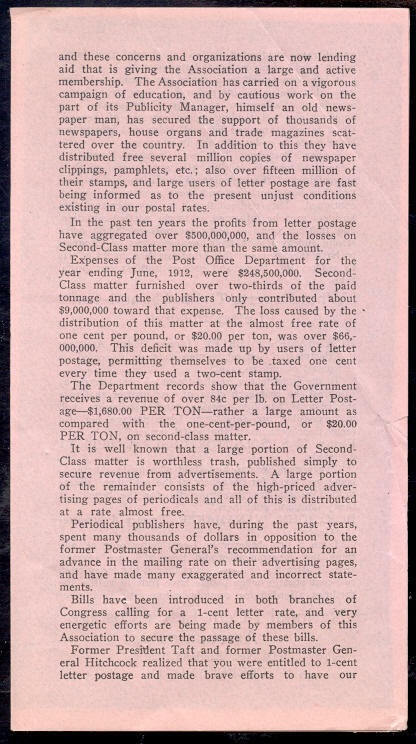 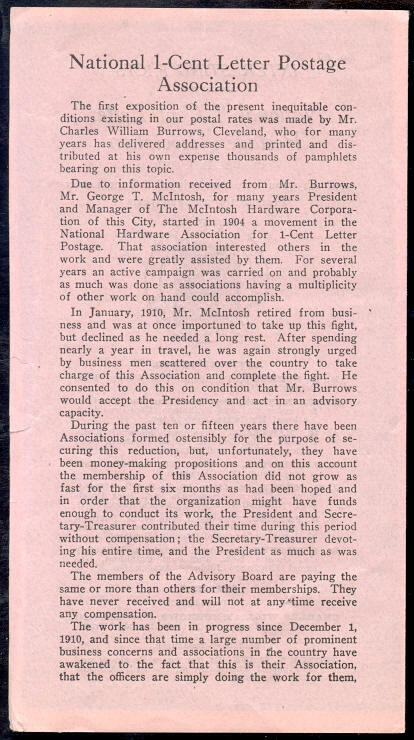 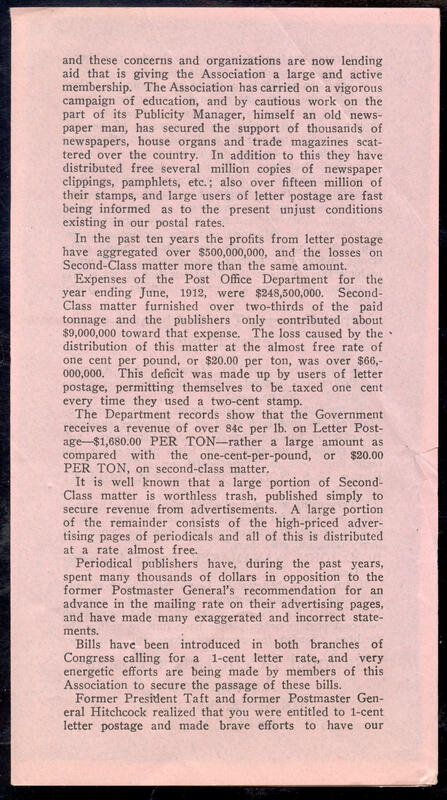 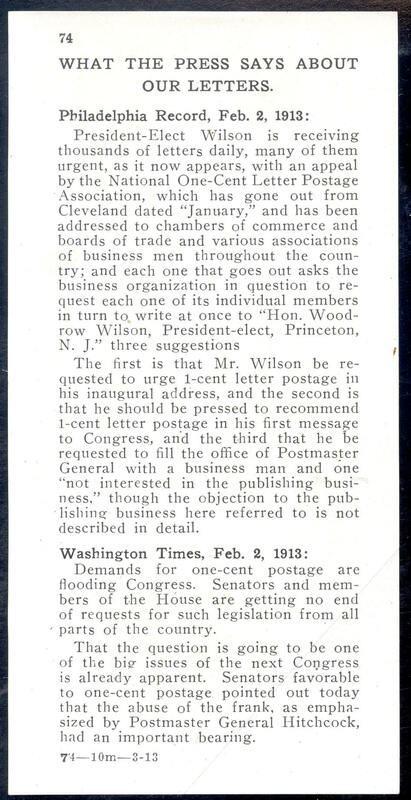 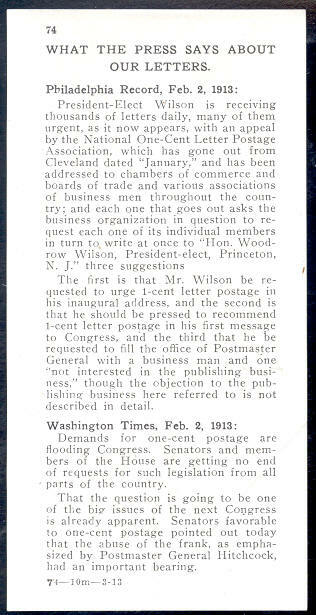 No 74 boasts about newspaper coverage of its campaign urging newly elected President Wilson to support a 1¢ First Class postage rate. Pamphlet B is again a membership application offering a reduced membership fee to those using less than $100 postage per year. 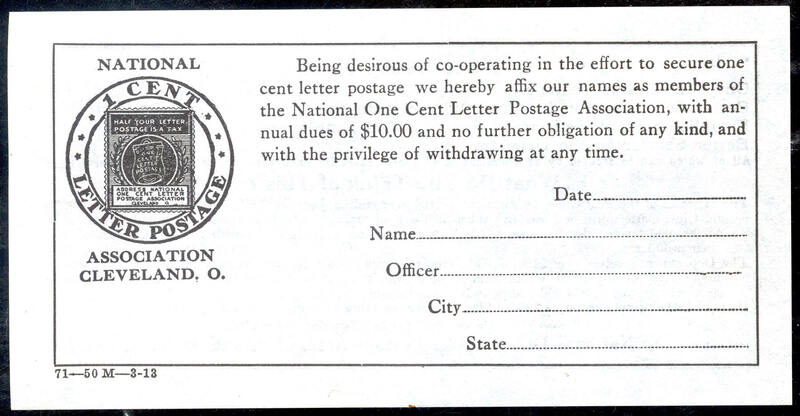 The logo seal on the reverse is like that of No 71. 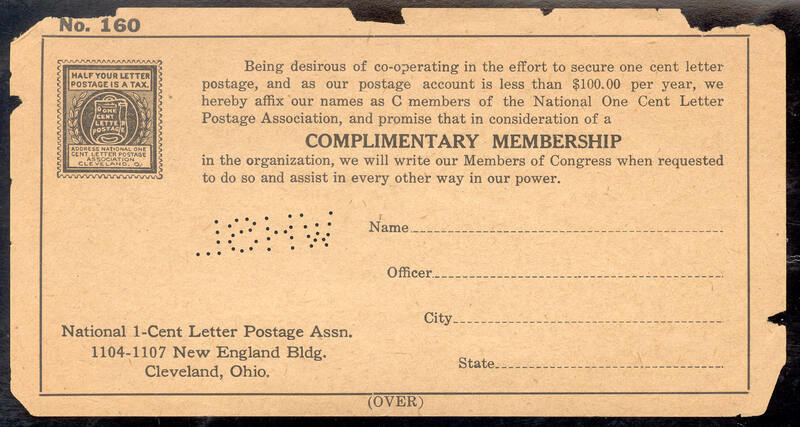 No 160 is another type of membership application but this time offering a complimentary membership for small mailers. 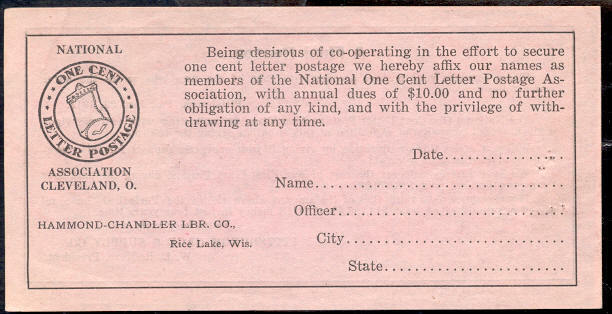 The seal on the reverse is similar to a Type II seal.